Philippe III redirects here. It can also refer to Philippe III de Croÿ and Philippe III, Duke of Orléans. Philip III (30 April 1245 – 5 October 1285), called the Bold (French: le Hardi), was King of France from 1270 to 1285, the tenth from the House of Capet. Philip proved indecisive, soft in nature, and timid. The strong personalities of his parents apparently crushed him, and policies of his father dominated him. People called him "the Bold" on the basis of his abilities in combat and on horseback and not on the basis of his political or personal character. He was pious but not cultivated. He followed the suggestions of others, first of Pierre de La Broce and then of his uncle King Charles I of Naples, Sicily, and Albania. His father, Louis IX, died in Tunis during the Eighth Crusade. Philip, who was accompanying him, came back to France to claim his throne and was anointed at Reims in 1271. Philip made numerous territorial acquisitions during his reign, the most notable being the County of Toulouse which was annexed to the Crown lands of France in 1271. Following the Sicilian Vespers, a rebellion triggered by Peter III of Aragon against Philip's uncle Charles I of Naples, Philip led an unsuccessful Aragonese Crusade in support of his uncle. Philip was forced to retreat and died from dysentry in Perpignan in 1285. He was succeeded by his son Philip the Fair. Philip was born in Poissy to King Saint Louis IX of France and Margaret of Provence, queen consort of France. As a younger son, Philip was not expected to rule a kingdom. At the death of his elder brother Louis in 1260, he became the heir to the throne. He was then 15 years old and had less skill than his brother, being of a gentle character, submissive, timid and versatile, almost crushed by the strong personalities of his parents. His mother Margaret made him promise to remain under her tutelage until the age of 30, but his father King Louis had him released from this oath by the pope, preferring to improve his son through education. Pope Urban IV released Philip from his oath on 6 June 1263. From 1268 Pierre de La Brosse became mentor. Saint Louis also provided him his own advice, writing in particular Enseignements, which inculcate primarily the notion of justice as the first duty of the king. He also received a very faith-oriented education. Guillaume d'Ercuis was also his chaplain before being the tutor of his son, the future king Philip IV. Following the Treaty of Corbeil (1258), concluded on 11 March 1258 between James I of Aragon and his father, Philip was married in 1262 to Isabella of Aragon in Clermont by the archbishop of Rouen Eudes Rigaud. As Count of Orléans, he accompanied his father to the Eighth Crusade in Tunis, 1270. Shortly before his departure, St. Louis had given the regency of the kingdom into the hands of Mathieu de Vendôme and Simon II de Clermont-Nesle, Count of Clermont, to whom he had also entrusted the royal seal. After taking Carthage, the army was struck by an epidemic of dysentery, which spared neither Philip nor his family. His brother John Tristan, Count of Valois died first, on 3 August, and on 25 August the king died. [a] To prevent putrefaction of the remains of the sovereign, they recoursed to Mos Teutonicus. Philip, then 25 years old, was proclaimed king in Tunis. With neither great personality or will, very pious, but a good rider, he owed his nickname of "Bold" to his valor in combat than strength of character. He was unable to command the troops at the death of his father. He left his uncle Charles I of Naples to negotiate with Muhammad I al-Mustansir, Hafsid Sultan of Tunis; there was a truce of ten years which allowed him to return to France. He got the payment of tribute from the caliph of Tunis in exchange for the departure of the crusaders. A treaty was concluded 28 October 1270 between the kings of France, Sicily and Navarre and the barons on one hand and the caliph of Tunis on the other. Other deaths followed this debacle. In December, in Trapani, Sicily, the brother-in-law of Philip, King Theobald II of Navarre, died. He was quickly followed to the grave by Philip's sister Isabella. Finally, a month later, in Calabria, his wife Isabella, while pregnant with their fifth child, fell off her horse. She broke her spine, miscarried and died in terrible pain at Cosenza. Philip III arrived in Paris on 21 May 1271, and made foremost tribute to the deceased. The next day the funeral of his father was held. 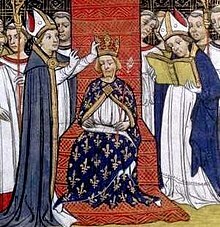 The new sovereign was crowned King of France in Reims 15 August 1271. Alphonse, Count of Poitiers and Toulouse, uncle of the newly crowned king Philip III, returning from the crusade, died childless in Italy on 21 August 1271. Philip inherited the counties from his uncle and united them to the Crown lands of France, the royal domain. His inheritance included a portion of Auvergne, then the Terre royale d'Auvergne, later the Duchy of Auvergne. In accordance with wishes of Alphonse, he granted the Comtat Venaissin to Blessed Pope Gregory X in 1274. This inheritance also included the Agenais. Several years of negotiations yielded the Treaty of Amiens (1279) with King Edward I of England, which restored this territory to the English. King Philip III of France meanwhile supported policy of his uncle, King Charles I of Naples, Sicily, and Albania, in Italy. King Peter III of Aragon and Valencia in 1282 triggered the Sicilian Vespers rebellion against King Charles I of Naples, Sicily, and Albania. The success of rebellion and invasion led to the coronation of Peter III of Aragon as king of Sicily therefore beginning the dynasty of the House of Barcelona in Sicily. King Peter II of Aragon in 1205 put his realm under the suzerainty of the pope. Pope Martin IV excommunicated king Peter III of Aragon, the conqueror, and declared his kingdom forfeit. The pope then granted Aragon to Charles, Count of Valois, son of Philip III, king of France. Joan I of Navarre, daughter of the deceased king Henry I of Navarre, reigned as queen regnant of Navarre. Philip IV of France, son of Philip III and heir to the French throne, took her as his wife in 1284 per the Treaty of Orléans signed by Philip III and Joan's mother, Blanche of Artois. In 1284, Peter, Count of Perche and Alençon, died without surviving children; therefore, his oldest living brother, Philip III, king of France, inherited his domains. Philip III of France in 1284 responded to the Sicilian Vespers in support of his partially dethroned uncle. With his sons, the king entered Roussillon at the head of a large army on the ultimately unsuccessful Aragonese Crusade. The war took the name "crusade" from its papal sanction; nevertheless, one historian labelled it "perhaps the most unjust, unnecessary and calamitous enterprise ever undertaken by the Capetian monarchy.". On 26 June 1285, Philip III the Bold entrenched himself before Girona in an attempt to besiege the city. Despite the strong resistance, the French took Girona on 7 September 1285. Philip quickly experienced a reversal, however, as an epidemic of dysentery hit hard the French camp. The disease afflicted king Philip III personally. The French retreated, and the Aragonese enemy handily defeated the French at the Battle of the Col de Panissars on 1 October 1285. Philip III died of dysentery in Perpignan, the capital of his ally James II of Majorca, on 5 October 1285. His son, Philip IV of France the Fair, succeeded him as king of France. The attempt of Philip to conquer Aragon nearly bankrupted the French monarchy, causing challenges for his successor. Following the Mos Teutonicus custom, his body was divided in several parts buried in different places : the flesh was sent to the Narbonne Cathedral, the entrails to La Noë abbey in Normandy, his heart to the now-demolished church of the Couvent des Jacobins in Paris and his bones to Basilica of St Denis, at the time north of Paris. In the Divine Comedy, Dante envisions the spirit of Philip outside the gates of Purgatory with a number of other contemporary European rulers. Dante does not name Philip directly, but refers to him as "the small-nosed" and "the father of the Pest of France," a reference to king Philip IV of France. Louis (died May 1276). He was poisoned, possibly by orders of his stepmother. Blanche of France, Duchess of Austria (1278 – 19 March 1305, Vienna), married the duke, the future king Rudolf I of Bohemia and Poland, on 25 May 1300. ^ The disease in question was either dysentery or typhus. ^ Hallam 1980, p. 275. ^ Bradbury 2007, p. 237. ^ a b Riley-Smith 2005, pp. 210–211. ^ Bradbury 2007, p. 239. ^ Chaytor 1933, p. 105. ^ Sumption 1990, p. 24. ^ Cárdenas 2014, p. ?. ^ de Pontfarcy 2010, p. 691. ^ Jordan 2007, p. 727. ^ Woodacre 2013, p. xviii. ^ Earenfight 2013, p. 158. ^ Morrison & Hedeman 2010, p. 4. Bradbury, Jim (2007). The Capetians: The History of a Dynasty. Continuum. Cárdenas, Fabricio (2014). 66 petites histoires du Pays Catalan (in French). Ultima Necat. Chaytor, H.J. (1933). A History of Aragon and Catalonia. Methuen Publishing Ltd.
Earenfight, Theresa (2013). Queenship in Medieval Europe. Palgrave Macmillan. Hallam, Elizabeth M. (1980). Capetian France: 987–1328. Longman. Henneman, John Bell (1971). Royal Taxation in Fourteenth-Century France: The Development of War Financing, 1322–1359. Princeton University Press. Jordan, William Chester (2007). "Philip III the Bold". In Kibler, William W.; Zinn, Grover A. (eds.). Medieval France: An Encyclopedia. Routledge. Morrison, Elizabeth; Hedeman, Anne Dawson, eds. (2010). Imagining the Past in France: History in Manuscript Painting, 1250–1500. J. Paul Getty Museum. de Pontfarcy, Yolanda (2010). "Philip III". In Lansing, Richard (ed.). The Dante Encyclopedia. Routledge. Riley-Smith, Jonathan (2005). The Crusades: A History. Continuum. Sumption, Jonathan (1990). The Hundred Years War:Trial by Battle. Vol. I. Faber and Faber Limited. Woodacre, Elena (2013). The Queens Regnant of Navarre. Palgrave Macmillan. Chaytor, H. J. A History of Aragon and Catalonia. 1933.